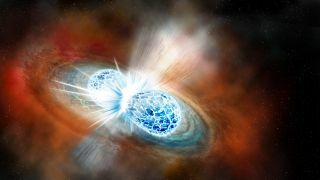 An artist's illustration of two neutron stars crashing into each other. Galileo Galilei, the first modern scientist, was a lone wolf. With his tiny refractor telescope and many nights of solo observations, Galileo dramatically altered the trajectory of human culture. But the days when an isolated genius can redirect our root perception of the universe are probably over. With the detection of a neutron-star merger on Aug. 17, 2017, and the capture of its afterglow over the following 18 days, astronomy passed through a diode of sorts: a gate swinging closed behind the solitary astronomer. This was the dawn of "multimessenger" astrophysics — events seen through emissions across the electromagnetic spectrum and heard via gravitational waves rippling the substance of space-time itself. Neutron stars are the hardest hardballs nature knows how to throw. Andy Howell, staff scientist at the University of California, Santa Barbara's Las Cumbres Observatory, likens them to gigantic atomic nuclei, but they consist entirely of neutrons (as opposed to actual nuclei, which also have protons). As they spin closer to each other, they bleed off orbital energy to power gravitational waves. When neutron stars ram together, the ultrabright flash they create — known as a kilonova — reveals what they're made of and what new elements they make as they clash. First spottedby three gravitational-wave detectors thousands of miles apart and then marked less than 2 seconds later by two gamma-ray instruments in space, the visible smoldering remains of the star-crash took less than 10 hours to locate on the sky. Seven observatories independently found it, the first within about 45 minutes of beginning to search — a new bright object in the old galaxy named NGC 4993, which lies about 130 million light-years from Earth. More than 70 facilities, operating more than 100 telescopes across seven continents, scrambled to make measurements in every part of the electromagnetic spectrum. They refined, for one another, where to look and what to look for. They chased the event's evolution, handing it off to one another, as the afterglow shifted from shining brightly in ultraviolet and blue wavelengths down to red in about three days. And they worked as the emissions smoldered in infrared and radio frequencies. They caught echoes in X-rays. The newfound light source was especially challenging because it lay near the sun in Earth's sky and was observable each night for just an hour or so. But with the wealth of data from many widely varying viewpoints, several fundamental astrophysics cases were closed in just a few weeks of detective work. The confluence of low-cost computing, sophisticated image-compositing algorithms, low-cost sensor arrays and the ubiquitous internet set the stage. With laser-aligned robotic optics correcting for atmospheric distortion and telescopes flying above all that "pea soup" bypassing the problem entirely, collaborative observation has been ramping up throughout this young century. This was Big Astronomy's defining moment. Adding gravitational-wave data to the visual mix supplies a soundtrack to the motion picture, said Dave Reitze, executive director of the Laser Interferometer Gravitational-wave Observatory (LIGO) Lab at Caltech. Big Astronomy requires the placing of big bets. The National Science Foundation made one such colossal wager starting in the 1980s, with its early and sustained support of the LIGO project at Caltech and MIT. At the time, no one was certain the instrument could be built. Some were sure it couldn't. Decades earlier, Albert Einstein was convinced that it was folly to try. According to Einstein's own 1915 field equations comprising his theory of general relativity, space-time is very stiff stuff. It takes a titanic release of energy to dent it, even a little. And it takes an almost incomprehensibly sensitive instrument to detect the gravitational-wave train produced by such an event. Even the mind of Einstein could not have foreseen the pace of technological advancement over the century that would follow. LIGO's first detection — of two coalescing black holes, which came on Sept. 14, 2015 — at long last confirmed Einstein's mathematical prediction that gravitational waves would be detected. The multimessenger neutron-star merger discovery of Aug. 17, 2017 (which was announced in October) extended that harvest of new knowledge: After traversing the cosmos for 130 million years, its gravitational wavefront, and its gamma-ray light burst, arrived within less than 2 seconds of each other. Now, astronomers know where some of these gamma-ray bursts came from. The near-simultaneous arrival also authenticates Einstein's supposition that the speed of light is in fact the law of the universe; electromagnetic radiation and gravitational waves travel at that same rate. That, in turn, gives cosmologists a new tape measure with which to gauge the accelerating expansion rate of the universe, the currently fuzzy number known as the Hubble constant. Then came the spectrographic analysis of the star crash's light, confirming that many heavy elements, like platinum and uranium, are created when such superdense stellar corpses collide. We mine gold — not make it — because ancient neutron-star smackdowns did all the truly hard work. All those astronomers and administrators — over 1,000 people — who mobilized to catch the last lights of the collision deserve as much pride as they may allow themselves to feel. Many dropped their own observing campaigns to slew over to NGC 4993. But what happens when an upgraded LIGO comes back online and the detections start rolling in monthly? Or piling up weekly? Stuff blows up somewhere in the cosmos all the time. Which events will get priority, and why? We're in a new era, and fresh protocols are required. Also needed, several researchers say, are a few robot telescopes whose main concern is vigilance to capture such multimessages as the universe may send. The narrative of the August 2017 neutron-star crash is one of rapidly reactive observation. But the next chapter in Big Astronomy may be written in the language of retroactive discovery. Programs such as the Large Synoptic Survey Telescope will image nearly all of the sky, nearly all of the time. With truly gargantuan data storage and witch-wizardly adept algorithms to comb through it, transient events will be captured long before their significance is suspected. The coming big discoveries about the universe won't be the results of people playing a diligent game of telephone. Truly intelligent automation will probably characterize, correlate and flag the most significant observations for human astronomers' attention. Networked instruments — imagers, spectrographs and interferometers — could serve up the breakthroughs almost fully baked. But researchers must artfully and collaboratively code them to set the boundary conditions for discovery. Big Astronomy's next breakthroughs will come from a lot of people agreeing to ask the right questions. My colleagues and I have made a short film, "Star Crash — The Explosion That Transformed Astronomy," conveying the startling story surrounding the detection of this summer's neutron-star merger. We hope our telling of the story lives up to the valor of those who lived it.